George Hallmark's paintings combine his love of architecture and art in outstanding images that take the viewer to many exotic locales around the world. 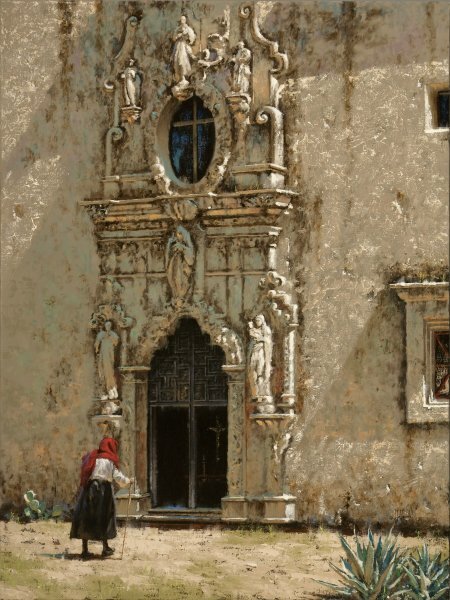 This release takes the viewer to a beautiful mission, La Riena (The Queen), Mission San Jose y San Miguel de Aguayo, near San Antonio, Texas. The magnificent entry of the church, featuring sculptural figures and detailed adornment around the doors, offers a majestic, yet serene, place of worship. After Mission San Antonio de Valero was founded, many of the local Indians remained unfriendly with each other and refused to worship together. The man in charge of the Franciscan presence in Texas was Father Antonio Margil de Jesus. Father Margil decided to build another mission in San Antonio, a few miles away. He contacted the governor of Coahuila and Texas, the Marques de San Miguel de Aguayo. On January 22, 1720, the Marques agreed to not only authorize its founding, but financed the undertaking as well. The new mission was named San Jose and known by travelers as the "Queen of the Missions of New Spain".